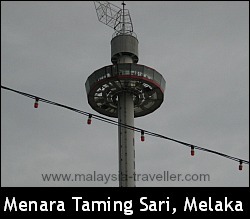 Menara Taming Sari is a 110 metre high tower in the centre of Melaka with a revolving viewing platform providing visitors with a panoramic 360 degree view of the city. It calls itself the 'First Revolving Gyro Tower in Malaysia'. There are similar rides in Singapore and Hong Kong among other places. The fiercely air-conditioned viewing platform can hold 66 passengers and once there are enough people on board the ride begins, lifting passengers to a height of 80 metres and rotating for about 7 minutes before descending back to ground level. The technology is Swiss and the ride was built at a cost of RM 24 million. From the top you can get a good view of the surrounding area including the reclaimed Pulau Melaka and out to sea, the nearby Maritime Museum and the scale replica of a Portuguese galleon, and the neighbouring Makhota Parade shopping mall. It's worth doing at the beginning of your visit to Melaka as it will help you to get your bearings and give you ideas for which attraction to visit next!